Nem is from Burma, now called Myanmar. After finishing Grade 8, she married, and had 2 children. Living in the city of Kalay, she worked from her home as a businesswoman – buying products from the mountain dwellers, and selling to city customers. Misfortune struck the young family, and her husband died. Nem also became ill, but the health care and medication needed were unavailable in the area. She had to make the difficult decision to leave her children behind, in the care of their grandparents, to move and receive the medical treatment required to save her own life. In Malaysia, Nem received health care. After some time she was well enough to work, and got a job as a restaurant server. A year later, she married Pau, and they applied as refugees. She was given 8 months to contact her children (to accompany the family to Canada). Some extended family members did not want the children to leave the country, so contact was made impossible. When they left, 2½ years later, it was without her children. Nem was asked “Why do you want to go to Canada? It is a lot quicker and easier to go to the US!” However, with a sister in Canada and a better health care system, they chose Canada. They stayed in Saskatoon, near her sister and 5 children for a couple of years. Healed, Nem and her husband moved to Regina in January 2015, for a better job opportunity. Unfortunately, it fell through, but not until after they had relocated. Nem speaks very little English. Her husband Pau continues to work long hours – leaving the apartment at 7am, and returning home after 10pm. 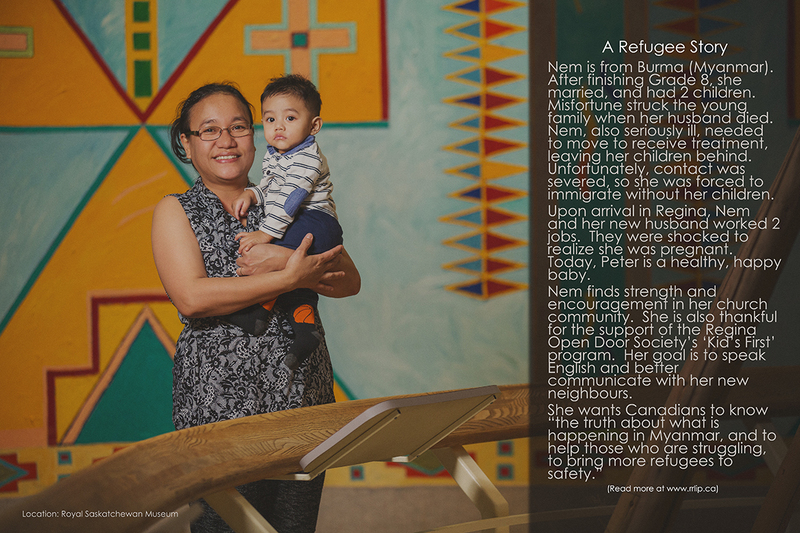 Upon arrival in Regina, Nem worked 2 jobs - then was shocked and surprised to realize she was pregnant. Her time in Regina has consisted of working (in janitorial roles), grocery shopping, prenatal and postnatal doctor visits and looking after her baby. With no transportation or English and a new baby, she has felt isolated, and confined to the apartment. Little Peter is a happy, healthy baby, bringing much joy to the family. Nem is very thankful for the Kids’s First Program and Regina Open Door Society for the many supports they have given (utilizing translators to communicate). The Chin Community Church has also been a great encouragement. Nem’s desire is to see Peter grow up strong and healthy. She hopes that someday, when he is grown, they can go visit the children she was forced to leave behind. Nem est originaire de la Birmanie (Myanmar). Après avoir terminé la huitième année, elle s’est mariée et a eu deux enfants. Sa jeune famille a été frappée de misère lorsque son mari est décédé. Nem, aussi gravement malade, a dû déménager pour se faire soigner, laissant derrière elle ses enfants. Malheureusement, le contact a été coupé entre eux, donc elle a été forcée d’immigrer sans ses enfants. Dès son arrivée à Regina, Nem et son nouveau mari ont tous les deux eu à occuper deux postes. Ils ont été surpris d’apprendre qu’elle était enceinte. Aujourd’hui, Peter est un bébé joyeux et en santé. Nem trouve de la force et de l’encouragement dans sa communauté religieuse. 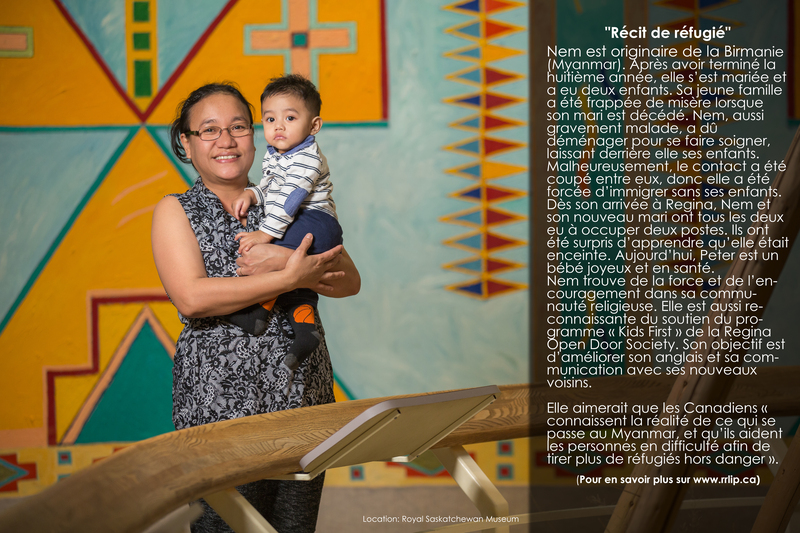 Elle est aussi reconnaissante du soutien du programme « Kids First » de la Regina Open Door Society. Son objectif est d’améliorer son anglais et sa communication avec ses nouveaux voisins. Elle aimerait que les Canadiens « connaissent la réalité de ce qui se passe au Myanmar, et qu’ils aident les personnes en difficulté afin de tirer plus de réfugiés hors danger ».